Jenny Wang’s continues to remain BotF’s North Asia correspondent’s best source of new and untried beers. Jenny’s as it is affectionately know with the locals is not only a great source of beer but is also a great place to shop and reminds me a lot of the local supermarkets in Australia in the 70’s & 80’s where there was always lots of help to bring those heavy Grocery bag’s to the car. Mr. Shen (another alias) is one of those guys who you just love in an instant. He is a long term employee of Jenny’s and you always get a big loud “Ni Hao” and grin whever you see him. He falls overhimself to help you and won’t accept any prostestations. I explained BotF to Mr. Shen and he told me he had already heard of the site and the passionate beer pursuits of its members. 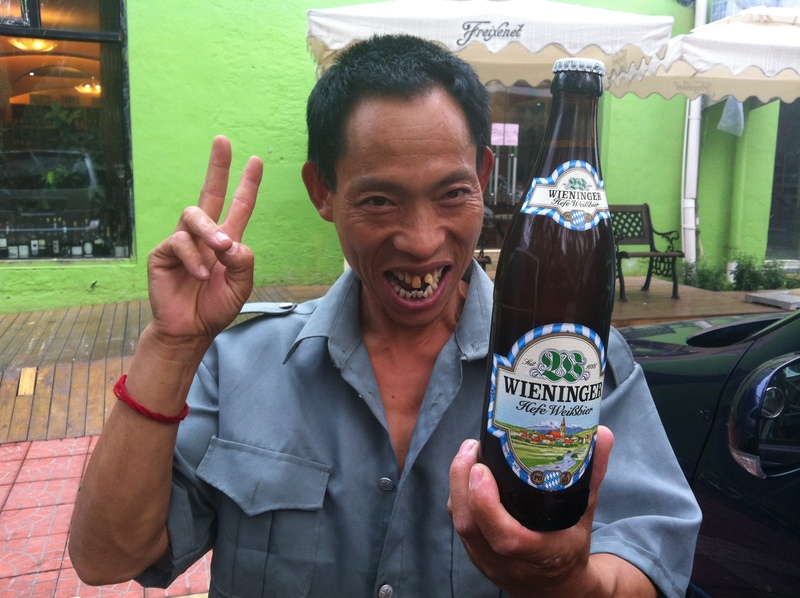 When I asked if he would mind me taking a photo with a yet to be sampled beer and he almost couldn’t contain himself. Weininger’s Hefe Weißbier is an old bavarian white beer made with the finest natural yeast and has the spicy taste of bananas and peaches. Those flavours do indeed come through although I had difficulty sensing the banana. Mr. Shen recomends it but only gives it two fingers out of a total three (which is the highest rating); I thought he was a bit harsh but nonetheless you have respect his opinion. Loving your work. A super photo and amusing tradition has commenced. Met a cotton bloke on Saturday night – Phil Thompson from Moree – who now lives in Sydney. He’ll be at the Goldie at the same conference. Loves a drop.